Tomorrow is pie day. Well it's actually π day. But any excuse to have some pie is acceptable. 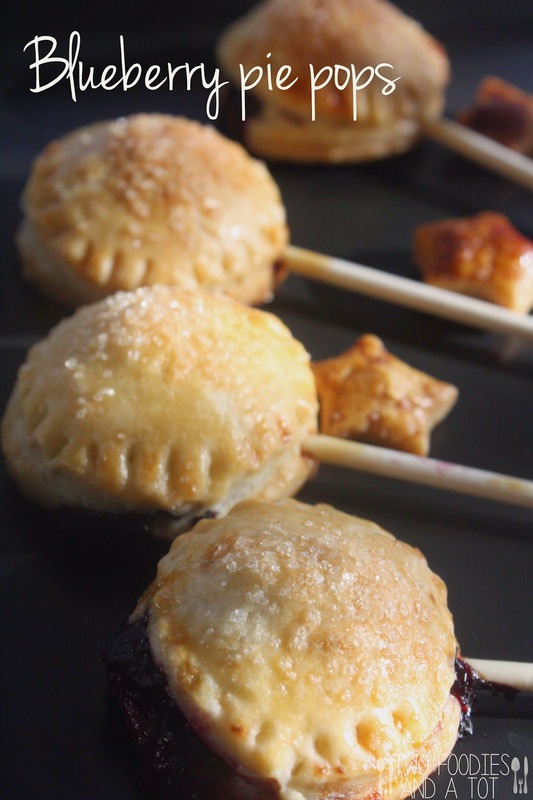 =) Pie day last year, we made these same blueberry pie pops and my tot very much enjoyed the whole process and of course eating them. This year, his skill is visibly improved! What a difference one year makes. It's amazing how fast kids grow and learn basic skills and fine motor skills. It's such a fun thing to make with kids, it's that simple. 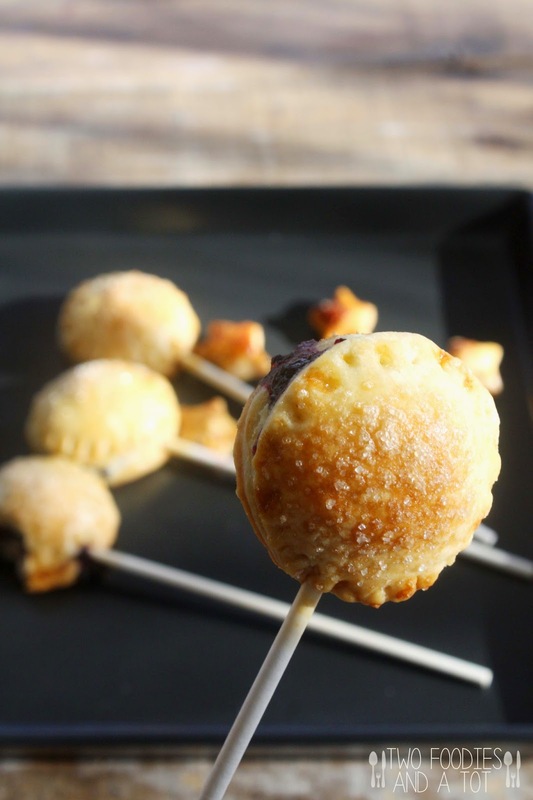 You can even dip the finished pie pops in chocolate and sprinkles if you want to go that way. Very pretty and yummy too. But this time, I felt like simple sprinkle of sugar. With the scraps of dough after cutting out circles, I used a small star cookie cutter and cut them out as just crust bites. Kids love those little bites. I sometimes make them all pretty covered with paper straw and ribbon but rustic pie pops have its own fun way of beauty too. 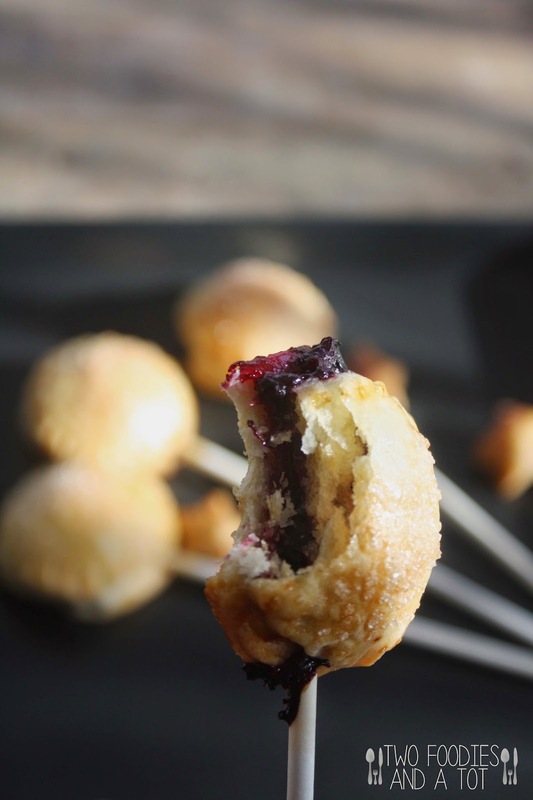 Blueberry filling recipe makes more than enough of filling for pie crust since you don't want to put too much filling on each pop as it might ooze out too much. You could double the crust recipe and make lots but if that's too much, you can just use it like jam. I usually use the leftover filling to dip some toasted bread sticks on another day. Try and roll out the pie dough on the thinner side, because you're not putting a lot of filling due to "oozing out issue", it might not be sweet enough if the crust is thick. 1. In a sauce pan, stir sugar, corn starch, nutmeg, cinnamon and water and bring it to a gentle boil. Add blueberries and simmer for 3-4 minutes until thicken. Stir in lemon juice and zest and cool. 2. Preheat the oven to 375F. Line a baking sheet. Roll out the pie crust, cut out big enough size of shapes you like. 3. Place a lollipop stick on a cut out dough and push it down to stick it but not all the way through. Place a dollop of filling in the center and brush egg wash around the edge and top it with another cut out dough. Crimp the edge with a fork. 4. Brush egg wash on top and sprinkle some sugar if you desire. Bake for 20 minutes or until golden brown. When done, cool it for a few minutes and enjoy! *They were still good the next day when stored in an airtight container.